Have you ever met such a case that you lost important data on your removable media devices,But you don't know how to get it back. Here we recommend you to try a best file recovery software for removable media devices which named Bitwar Data Recovery. it retrieve lost or formatted files and folders from thumb drive, pen drive, external hard disk drive (USB based), removable drive, compact flash memory card, multimedia card, SD card, micro drive, smart drive media, removable flash card memory, Smart Media, Compact Multimedia card, memory card, USB and other Equivalent Devices. Step 1:Download Bitwar Data Recovery and install it on your windows on it Official URL for your windows:http://www.bitwar.net/data-recovery-software/. You can also use Bitwar Data Recovery for Mac to restore under mac OS. Step 2: Launch Bitwar Data Recovery software and get its main interface as follows. 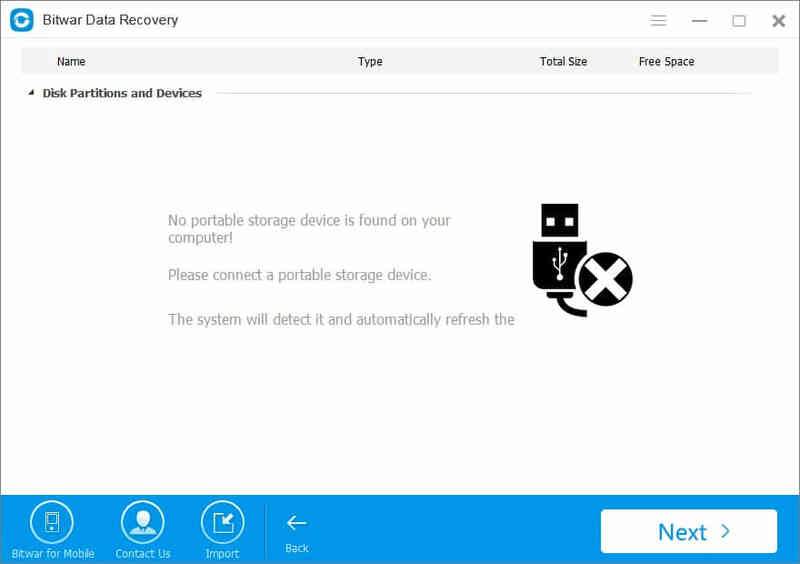 Select“USB/Memory Card Recovery”when you want to recover the lost data in removable media devices.Connect the removable media device which lost files to your computer. Step 3: please select the removable media devices on the program and click Next. Select the type of files you want to recover back from the removable media devices and click on the button "Next" . Step 4: Now, Bitwar Data Recovery will start scan quickly, you will see all missing files that match the selection will be listed one by one. With that you can preview them to make a selective recovery. After you determine which file you want to recover,select it and click "Recover" to save them to another Safe location in PC/storage device. Attention:Please do not save all the recovered files on the removable media devices in case of data recovery failure. Thus, the lost files during cut and paste has been recovered. the recovery process to recover lost files from removable media devices is no more tedious with Bitwar Data Recovery. Most importantly, it ensures to maintain data integrity and fast effective . Try it! Previous：How to recover lost notepad files? Next：How to undelete data with a file recovery software?